Episode 9: Teaching Peace to 1,000 Kids in 48 Hrs. + Grandmaster Maurice Ashley in St. Louis! Grandmaster Maurice Ashley and Adisa Banjoko at the Chase Park Plaza Hotel in St. Louis, room 333 some time after midnight. There are certain times in your life, where you feel it coming together. Right now is one of those moments. Shortly before I started Hip-Hop Chess Federation I interviewed Grandmaster Maurice Ashley for my second book Lyrical Swords Vol. 2: Westside Rebellion. The book also included interviews with RZA, GZA, Afrika Bambaataa and many others. I met him face to face through Jen Shahade in NY at a HHCF/9Queens event with the RZA. He was very supportive of the momentum we had. I told him then that there was no purpose in me doing what I did if he, Jen, Josh Waitzkin and others did not exist. I explained that HHCF for most serious chess players and fans is misunderstood. That I point people in their direction, knowing that you (meaning Maurice, Jen, Josh, and other GM's, WGM's etc.) do all the true heavy lifting. Over the years he and I would talk, or email, but we could never seem to catch up. Thankfully, Jen Shahade introduced me to Susan Barrett from the World Chess Hall of Fame and she invited Hip-Hop Chess Federation out to do several panel discussions on the history of where Hip-Hop, chess and martial arts interlock and how we can use it to inspire children toward self-mastery and self-discovery. The events they set up were nothing short of amazing. We went to the famous ICA school ran by Judge Jimmie Edwards. We hosted a panel at the St. Louis Library, the Confluence Academy (also one of the best schools I have ever been to!) and a juvenile hall detention center. To stand on Marilyn St. in Saint Louis between the World Chess Hall of Fame and the St. Louis Chess Club is like standing between Meeca and Jerusalem. The energy is electric. Among the other amazing things that happened though, is, Maurice Ashley interviewed me during the championships. It was a shock and I was truly nervous beyond words during the interview. But later the next night, I got to interview him. It was amazing!!! He talked about his early years as a young chess player, his time playing with Jay-Z and an amazing chess hustler set up match he had with jazz legend Wynton Marsalis. This stuff is simply beautiful. I hope you enjoy listening to it as much as much as we loved making it. St. Louis is a beautiful city and my experiences there made me a changed man. I understand chess culture better than I ever have. I want to thank a few people before I go and understand that the list is simply too long to really get everybody. But here it goes: Jen Shahade (you pulled the trigger on this, thank you so much!) Susan, Laura, Shannon, Amanda (great driving! ), St. Louis Police Department (the two nicest cops I ever met after a fender bender was in St. Louie! ), everybody at KMOX (Hi, Charlie and Debbie! ), Matt Barrett, Mike, and everybody at the St. Louis Chess Club for their kindness to the HHCF squad and my family. 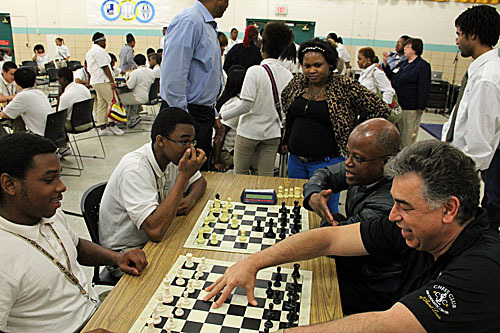 You all opened by eyes to a new level of chess culture and duty to serve the community. Thank you for making me a better citizen of the world. To my HHCF squad (The Furious Five): Mike Relm, Dr. James Peterson, Alan "Gumby" Marques, Asheru and Dr. Daaim Shabazz. You guys take the science and art of Hip-Hop, chess, martial arts and education to the next level. I could not imagine having a better experience in St. Louis than I had with you. Thank you for trusting my vision and bringing your best selves to the Live The Game event. A special shout out to Meek Gaborski (the titanium backbone of this organization) David Frazee Esq., Arash Daneshzadeh (HHCF's Education Director), LyRyan Russell, Elaine Moskowitze, Kay Hones, Pablo Fuentes, T-KASH, Dlabrie, Shamako and Rahman, Josh Waitzkin, Joe Schloss, Dawn-Elissa Fischer, Davey D, RZA, Rakaa Iriscience, Ralek, Ryron and Rener Gracie, Denny Prokopos, Eddie Bravo and a lot of the real Hip-Hop, chess and jiu jitsu folks that really put it down for us back when nobody believed in the fusion of Hip-Hop, chess and martial arts. To Judge Jimmie Edwards at ICA, the St. Louis Library, to everybody at Confluence Academy and St. Louis Juvenile Detention Center I want to thank you for your open minds, for giving us a chance to speak to your youth and trusting that our vision could help. Any time you need us, please reach out. You all do amazing work and everybody at HHCF was left inspired beyond measure. FOOD SHOUTS: Lesters, Bar Italia, Drunken Fish and PAPPYS (thanks for the extra bottle of sauce, but TSA gaffled it). PHOTO CREDITS: Shots of ICA credit Daaim Shabazz. Photos of Maurice Ashley and Adisa Banjoko credit Mike Relm.